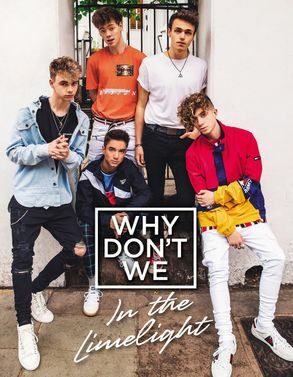 Jam-packed with never-before-seen photos that take you behind the scenes of the creation of their music, their tours, and their incredible friendship, this is the 100% official biography of Why Don't We! In the Limelight is the official Why Don’t We autobiography, full of never-before-seen photos and behind-the-scenes info about one of today’s hottest bands. When five guys decided to form a band, they never imagined that they would go from playing music online to playing tours across the world so quickly. Why Don’t We has been together for less than two years, and they’ve already headlined sold out shows, played at Madison Square Garden, and amassed millions of fans. And this is all just the beginning. This is the official Why Don’t We story, full of never-before-seen photos and everything you need to know about Corbyn, Daniel, Zach, Jonah, and Jack. Find out the secrets they’ve never shared with fans before, their embarrassing childhood stories, what they look for in a girlfriend, and how it felt to have their lives completely changed by this incredible journey.